Log homes or cabins are often built to include stone chimneys. Since the beginning of time, humans have been building with stone and wood in some form or another. Both have great structural qualities and stand up to the test of time. The problem comes in when moisture and condensation from stone meets wood. I have seen hundreds of beautiful log homes and cabins with fireplaces, foundations, and pillars made of stone that were built next to logs. While some last for hundreds of years, others do not. Stone that is not sealed properly can hold moisture for months and even years and sweat next to wood beams or logs. 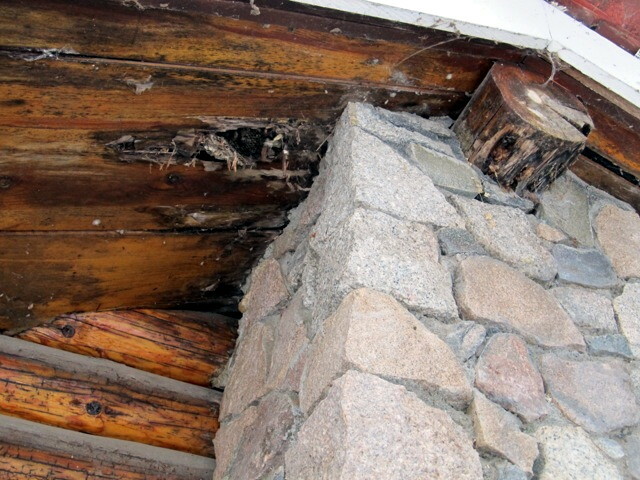 The most common places where it can cause logs to rot are along chimneys and foundations. Quite often, the logs will be set in concrete, creating a pocket that holds water like a cork holds wine in a bottle. Unlike a cork, the log has oxygen and water inside of it, which combined can create mold and rot in a short time. There is a solution to this problem, but first a person needs to identify any potential problem locations on a particular log building. 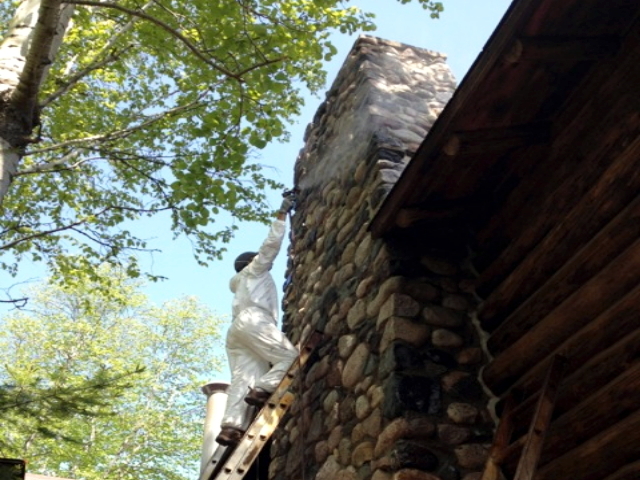 A trained professional can look at a stone foundation or a chimney and find problem areas. If logs are at all imbedded into the mortar around the stone, it could result in rotten logs. Log ends are often set into concrete near footings and where an exterior chimney bisects a wall. At Edmunds & Company, we have trained people who can use a jack hammer or air chisel to remove the mortar to unveil any existing problems. We use Perma-Chink brand chinking to seal these intersections to make sure no water can be held up against the logs and cause rot. If you have concerns about the logs around your chimney or foundation, give us a call at 715-373-5744. We can help.